I have a Stype 280 cam in my '13 roadster. I have them in two other T's I own too. Stype recommends .010 for clearance, but I just don't think the valves are all seating properly. I'm thinking of increasing the clearance to .012. Comments? Larry -- There is no "y" in Stipe. I routinely use 10 on the intakes and 12 on the exhausts with those cams and haven't had any problems with them. If the valves are not seating properly, the extra .002" wont make any difference, all that will happen you will burn your valves out. If there is clearance between the lifter and the valve and the valves are not seating, you have a problem with the grind, carbon on the stems, or weak springs. Not the clearance. Larry - Not sure why you think the valves are not, "....all seating properly." But if that is the case, I would think that a compression test would be in order. Or, perhaps a compression test is why you suspect sticky valves....??? As far as a couple thousandths in excess of the recommended valve lash (clearance) I make a habit of usually adding a couple thousandths more valve lash, especially on exhaust valves. The only time a valve cools is during the time the valve is closed and firmly seated on the valve seat and radiating heat into the cooler engine block. And a bit more valve lash lets the valve remain "seated" just a bit longer and hence, cool a bit more. Yeah, it's only a very tiny bit longer, but it's every time the valve closes, and it all adds up! A little extra valve lash will make them a bit noisier, but if they're all the same, it'll hardly be noticeable. It's only when one valve has a bit more clearance than the others is when you can really hear it. And even THAT won't hurt anything; it's just an annoying and noticeable "tick" each time the tappet opens that one valve. I'm going to check the compression this week. I just haven't gotten around to it! Larry, if you're running the Stipe 280, consider advancing the cam timing 7-1/2 degrees. I've been running one in my Fordor for 5 years, and advanced it last week. It made an incredible difference in the power output of the engine. It does not lug at all going into high gear. The drawing is not mine, I found it on this forum. I was able to use a straight edge and drill press to drill the 3/8" holes in the new location. I put a Stripe cam in my engine this summer. I used 0.010 clearance and the valves are closing fine. Compression is good. After a few hundred miles I will go back and check the clearance. Ed, I thought the new 250 and 280 Stipe cams were already advanced? I know the Chaffin new one is. I run my 250 Stipe at .010 and close to .011 exh. 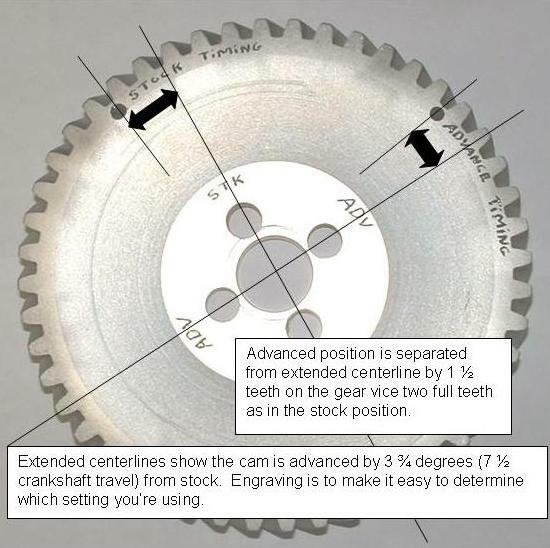 I use advanced timing gears with Stipe cams and regrinds from Rick Carnegie with excellent results. I have not used a Chaffin cam. That photo was one I posted years ago. What I should have done was post a picture of the old iron gear that I made a drilling jig from. Place the new gear on the jig and line up the dowel holes. Turn the new gear 12 1/2 teeth clockwise then clamp them together. Flip it over and drill the new holes using the holes in the old gear as a guide. I then used an engraver to indicate which holes went with which timing mark. It was easier to do that than to write this up.